Rio de Janeiro is Brazil’s most popular and second largest city, known locally as the Wonderful City, or Cidade Maravilhosa. Often mistaken as the country’s capital (which is, in fact, Brasilia), it is the one Brazilian city which attracts the most number of visitors each year. It’s not all that surprising really, when you consider that Rio is a hub of incredible attractions, vibrant nightlife and home to some of the country’s most recognisable landmarks. The fact the city is spread out along the base of many forest-filled hills, on the fringes of a breathtaking bay, and cradled by gorgeous tropical landscapes, definitely adds to its appeal. When it comes down to aesthetics alone, this stunning metropolis is unmatched in Brazil, if not all of South America. Add to this a cacophony of highlights, including the world famous Christ the Redeemer, Ipanema and Copacabana beaches and the Sambódromo da Marquês de Sapucaí (home of the yearly Rio Carnival ), and what you have is an incredibly vibrant, interesting and fun city to explore at length. Being one of the world’s largest countries, Brazil requires quite a bit of time to discover, due to enormous distances and lack of major infrastructure outside the main hubs. Spending a few days in Rio before moving on is an excellent idea, as transport options from here are both extensive and convenient. 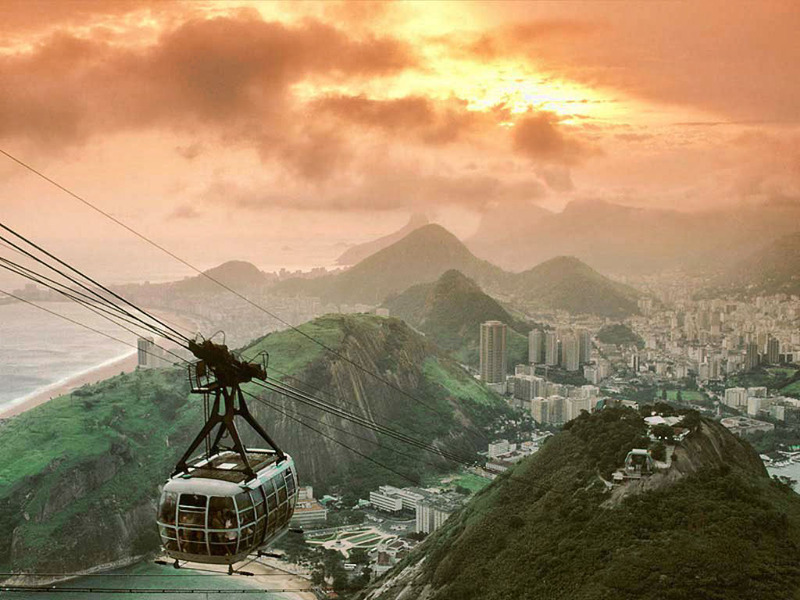 If you don’t have much time on your hands than never fear: Rio is definitely reason enough to visit Brazil! Portuguese explorers first landed in modern-day Rio in January 1500 and for the first half a century thereafter this was an area hotly contested with the French. Once the Portuguese solidified their colonial rule, in 1565, the city of Rio de Janeiro (or River of January) was properly found. An important port stop for trade, Rio became even more pivotal a century after it was established, thanks to the discovery of precious minerals in nearby Minas Gerais State. With the trade of gold and diamonds on the cards, as well as an established sugar industry, Rio expanded at a head-spinning rate. During Napoleon’s invasion of Portugal, both the Portuguese Royal Family and administrative kingdom were moved to Rio, making it the only European Capital outside of Europe. Along with the influx of noble families, came almost a quarter of a million African slaves. While Mexico and Peru hold the record for most slaves imported into the Americas, Brazil was a major player in the African-American slave trade, leading to the long-term cultural enrichment of the country. Everything from the cuisine, music, customs and beliefs of modern-day Brazil, stems from its long-standing African influence. The decrease of precious metals in nearby regions led to a diversion of trade and, by the early 1820s, diamonds had been almost completely replaced by coffee beans. Even this trading high, however, was rather short lived. By the early 1900s, the regions around Rio had been depleted of arable land, the monarchy had been replaced by a republic and, by the 1960s, the administrative capital of the country had been shifted to Brasilia. 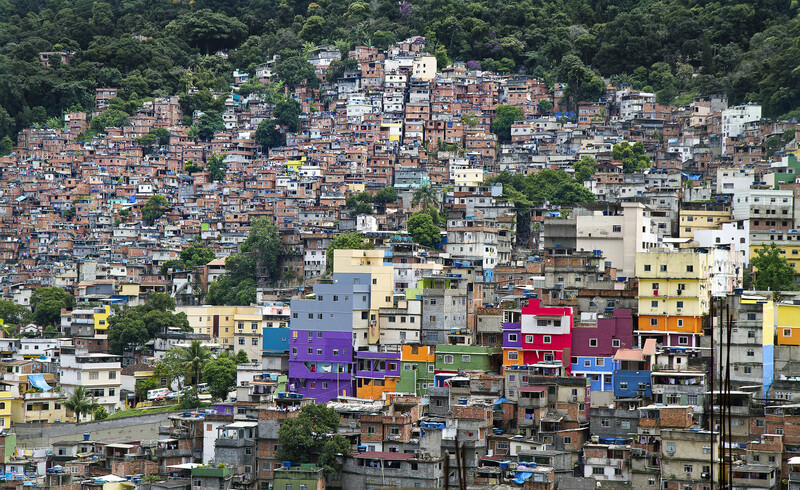 It is this loss of economic power which has been blamed for the rise of the slums (favelas) in Rio; with the overflow of poor migrant farmers not matched by job availability. Nowadays, over 6.5 million people live in Rio and, while Brasilia is the administrative headquarter of the country, this bustling metropolis is the unrivalled financial and cultural hub. Its industrial power has finally granted it some stability, and the improvement of its reputation, in recent years, has had beneficial effects on the city’s tourism. Almost 2 million international visitors travel to Rio annually, with the number increasing by about 100,000 each year. Rio is quite the sprawling metropolis, although places of interests for tourists are thankfully grouped together in just two districts. Although you’ll find plenty of reasons to get on the metro and explore the furthest reaches of the city, the great majority of visitors prefer to base themselves in the following areas. Home of famous Ipanema and Copacabana beaches, Rio’s southern suburbs are the most popular base for foreign tourists who like to have trendy restaurants, cafes and nightclubs just a step away from their daytime sunbaking spots. This area is home to lovely, upscale neighbourhoods and offers access points to Sugarloaf Mountain, Corcovado and the Christ the Redeemer statue. The South Zone is also the safest area in which to stay. Ipanema hotels are more expensive than Copacabana, due to it much smaller, more exclusive and with fewer accommodation options. Leblon is a particularly great base for vacationing families. Rio’s downtown is home to the city’s major cultural attractions, like the National Museum of Fine Arts, Metropolitan Cathedral and Municipal Theatre. Hidden between the brand new high-rise office buildings of this modern financial district, is where you’ll find the city’s historic centre. If you prefer to fill your days with cultural sightseeing, but need not much action at night, then this will be a great accommodation base for you. Cable Car on Sugarloaf Mountain - Sugarloaf Mountain. Nature lovers, history buffs and culinary aficionados all agree: when it comes to all-encompassing South American city-scapes, there is no hub that delivers quite like Rio. Here are some of the most prominent landmarks you should visit. In a city brimming with conical-shaped hills, mystery still remains as to why Sugarloaf Mountain (or Pao de Azucar in Portuguese) has become the most prominent of all. 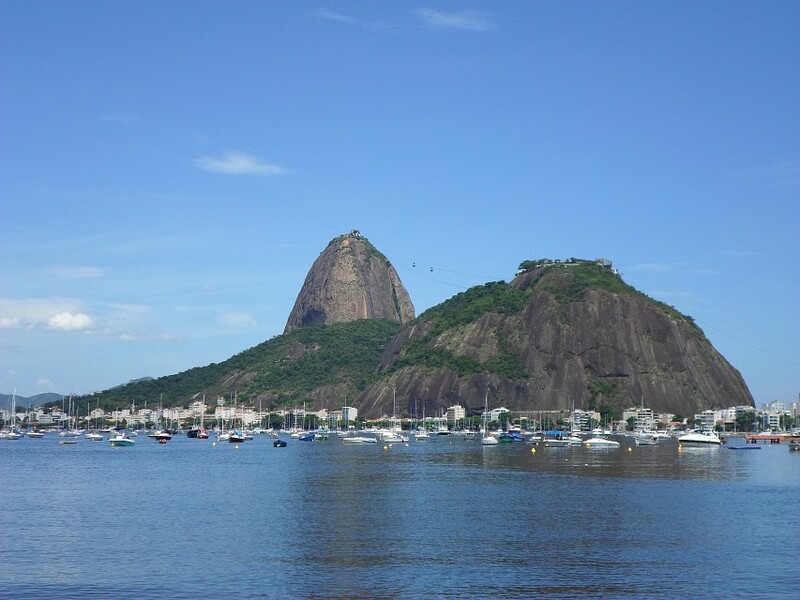 Named after the urns which were used to transport sugar for centuries on end, Sugarloaf is not only gorgeous to look at, but also grants breathtaking views of Rio’s bay and almost its entire metropolitan area. The 520m peak is reached via two cable cars, the first of which starts in Prahia Vermelha from the northern end of Copacabana. A sunset visit is the most rewarding of all, although the one which attracts the most crowds. Brave the hordes and you’ll be handsomely rewarded. 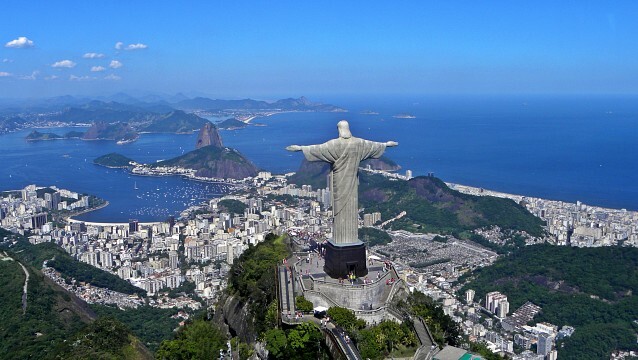 The world-famous statue of Christ with outstretched arms was built in 1931 in France and transported to Rio by ship, in pieces. One of the world’s largest religious monuments ever built, it is THE symbol of Brazil, a country which also counts among the most Catholic of all. The 38m tall, 700 tonne statue is best viewed on a crystal clear day, lest you only get a chance to view the Saviour’s toes. Cristo Redentor sits atop Corcovado, a 700m hill whose peak is reached by cable train from Rua Cosme Velho. This is the city’s most expensive landmark to visit, with high-season tickets costing USD62 per person, including entry into the national park. Although you’d certainly save a few dollars by getting up to the statue in a taxi, do note that the train grants superb views of Copacabana, Sugarloaf Mountain and the whole coastline, making the higher price well worthwhile. Ever since 1964, when Morale Vinicius wrote a famous song about a girl, the whole world has held a fascination with Ipanema Beach. To the astute traveller, the beach at Ipanema may not appear all that different from Copacabana and may not, in fact, be the country’s best by far. To see what a stunning Brazilian beach looks like, you’ll have head out to one of the stunning islands dotting the eastern coastline instead. 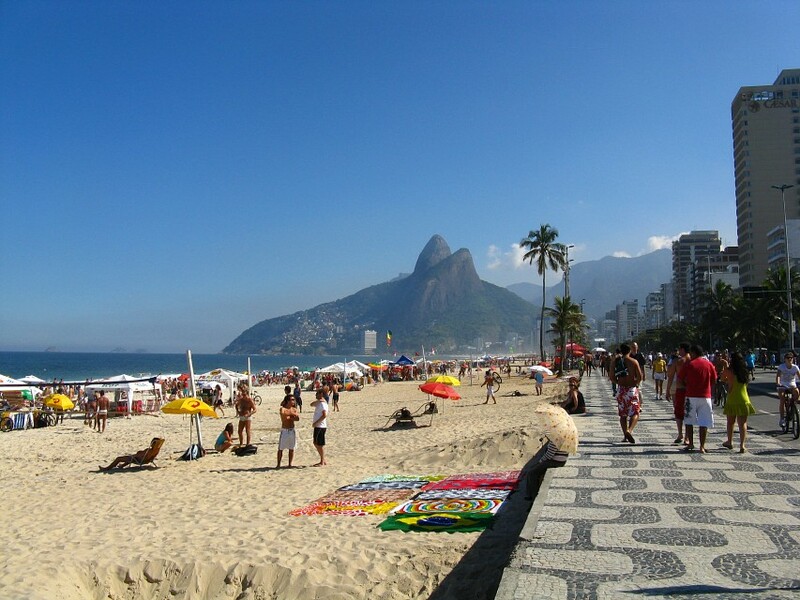 Nevertheless, the beach at Ipanema is still the most famous in Rio and, by consequence, the most visited of all. Where Ipanema really shines, however, is off the sand. This stylish hood, a favoured holiday destination of Brazil’s rich and famous for over four decades, is home to a plethora of trendy shops, clubs, bars and restaurants. If you want to really live it up in Rio during your vacation, then Ipanema is where you’ll need to be. There’s something magical about Rio’s beaches which has made artists sing lyrical for decades on end. Copacabana, Rio’s other famous seaside hub, is nowadays one of the most densely populated areas of the city and one of the most visited by tourists. The beach itself is no big treasure, mostly due to the fact that the overload of visitors usually translates in an ever-present overload of litter. Nevertheless, thanks to its stunning location, and striking Corcovado Mountain looking on, it still makes for an unmissable attraction. 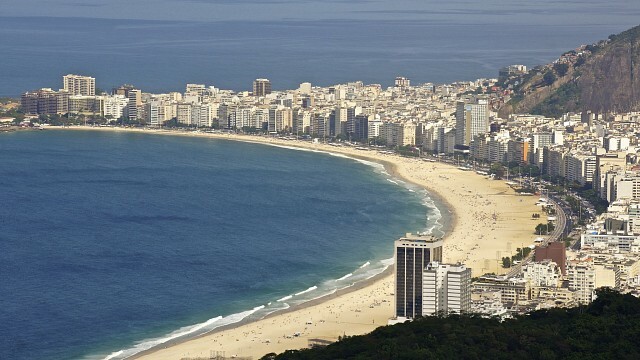 In Copacabana you’ll find Avenida Atlantica, the most famous address in town. This 5km long stretch of promenade is a fantastic walking path, particularly in the evening, when it comes to life with an endless array of outdoor eateries and more lively entertainment than anywhere else in town. The largest and most famous favela in all of Rio, Rochina has reached almost cult-like status among all of Rio’s sums. Built on a steep hill in the city’s southern end by former slaves with no land ownership, job or money, Rochina is nowadays a thriving suburb where crime and poverty still reign supreme yet where residents manage to lead perfectly good, albeit relatively speaking, lives. If you want to see how the other side lives in Rio, then make sure to book a tour with a reputable local company and head up to Rochina for a truly eye-opening experience. Rio’s Botanical Gardens are a haven of tranquillity and make for a brilliant escape from the crowds, sights and never-ending sounds of the frenetic city. If you’ve spent a few days in Rio and are feeling overwhelmed by the frantic vibe of it all, head out to the Botanical Gardens and take a pleasurable walk among the over 6000 different types of plants, trees and flowers, all endemic to Brazil and most of which are highly rare. You’ll also find more than 150 different birds here (including the gorgeous toucan), as well as various marmosets and monkeys. The high concentration of local flora and fauna in the park, as well as the fact that almost half of it has been left to grow wild, has ensured this place a spot in the UNESCO heritage list since 1992. Rio’s football stadium is one of the most revered landmarks in all of Brazil and was, up until recently, the largest of its kind in the world. In a country where football is as embedded into local culture as Catholicism, samba and feijoada , catching a local match while on a visit to the city should be considered as unmissable as climbing Corcovado or taking a few hundred snaps of Christ the Redeemer from every angle imaginable. The atmosphere at the stadium on game day is utterly insane, and is particularly crazy when local clubs (like Flamengo or Botafogo) meet head on for a championship title. The head stadium of the 2014 FIFA World Cup , Maracanã is in use all year long and hosts matches several times a week. Rio is an exciting destination for culinary buffs, and offers more choices and cuisines than all other South American cities combined. Although you’ll find a vast array of excellent foreign eateries, we highly recommend you indulge in local joints, where you can savour the best of Brazilian cuisine. Of the various restaurants, the ‘comida al kilo’ (where you fill your plate from a buffet and pay by weight) is the most ubiquitous, followed closely by churrascarias (BBQ meat havens) and rodizios, which are all-you-can-eat buffet joints. Perhaps unsurprisingly, considering Rio has the highest concentration of Japanese nationals in the world (outside Japan, naturally), sushi and sashimi restaurants abound here, and offer exceptionally great feeds. If you prefer more variety then head to Leblon, where you’ll find Dias Ferreira Street, home of the best up and coming international restaurants in the city. Rio’s nightlife is legendary the world over and Cariocas (locals of Rio) are renowned as some of the most fervent party animals in the continent. Spend but a few days here and you’ll soon realise that this generalisation is actually quite spot on. Cariocas’ obsession with music and dancing is as amusing as it is contagious. No matter where you go, you’re bound to come across a party of some sort, whether in a restaurant, bar, supermarket or even undergoing metro. Enjoyment of life is an utmost priority for Brazilians and this is, without a doubt, one of the most cherished aspects of the local culture. In Rio de Janeiro, this means that you won’t ever need to go very far to find a club or late night bar, especially if you stay in South Zone. Learning how to samba is a very popular activity here and you’ll find clubs holding dance classes all over the city. Moreover, the epic live music scene ensures that no matter your taste, whether it be for jazz, Latin or international sounds, you’ll find a plethora of great venues to visit. Although it will not be hard to find a fun place for a rowdy night out close to your accommodation choice, do note that all suburbs are renowned for a specific crowd, even though they all offer a variety of different nightclubs. If you want to party with friendly, hip young locals then head to Ipanema, if you want to mingle with a more sophisticated crowd stay in Copacabana and Santa Theresa (the artist’s quarter) and if you’re after the city’s vibrant gay scene then stay close to Botafogo. Rio’s touristy areas are awash with both upscale shopping malls and a plethora of street markets. Shopping at the latter is much more fun, as bartering here is seen as a skill to be tested and perfected. And do keep in mind that even if your bargaining skills are below par, the inflated prices are usually better than anything you’d find in a mall. The most popular items to buy are anything ‘Made in Brazil’, including clothing, bags, shoes (Hawaianas in particular), bikinis and colourful, bright hammocks and sarongs. Leather-made sandals and handbags are particularly great, of good quality and at just a fraction of the price of Europe or North America. Anything which is imported, electronics in particular, are exorbitantly expensive, so steer clear of those. Ipanema hosts a brilliant trinket market every Sunday, called the ‘Feira Hippie de Ipanema’. It doesn’t necessarily offer unique treats, but the vibe is great and it does offer the chance to get all your souvenir shopping out of the way in one swift go. On the Copacabana side of Avenida Atlantica is where you’ll find the Copacabana Night Markets which are held every night except Sunday. Here you’ll find a similar selection of the crowd-favourites found at the Ipanema fair, but on a much smaller scale. For the largest market in town, you’ll need to head to the Feira Nordestina São Cristóvão, about 8kms north of the Rio Botanical Gardens. This bustling market is a hive of activity especially on Sundays, when music, performances, dancing and capoeria are in full swing. The great selection of arts, crafts, clothing and food make it a fantastic shopping mecca as well. Shopping Centres in Rio are as omnipresent as churrascarias and, no matter where you stay, you’ll find a multi-floor, air-conditioned mall nearby. The nicest ones to visit for tourists are Shopping Leblon, Shopping Rio Sul (in Botafogo) and Barra Shopping which you’ll find in Barra da Tijuca. Do keep in mind, however, that mall shopping in Rio is not a major attraction for visitors, as prices are almost twice as much as what many will find in their own country, and the gear not all that dissimilar either. Being such a big, cosmopolitan city, Rio offers every accommodation choice imaginable, from exorbitantly lush hotels to cheap and cheerful hostels, and everything in between. Copacabana is home to more hotels than anywhere else in the city, and boasts the largest variety as well. Do note that prices vary considerably depending on the season you wish to visit. At carnival time, you can expect prices to be quintupled at the very least. The biggest festival in the world is held in Rio prior to Lent every year. The über-famous Carnival attracts more than 2 million visitors and has been held in Brazil for at least 250 years. The festival is a phenomenal show of samba magic, with dance schools from all over Rio competing fiercely to be a part of the final showdown. 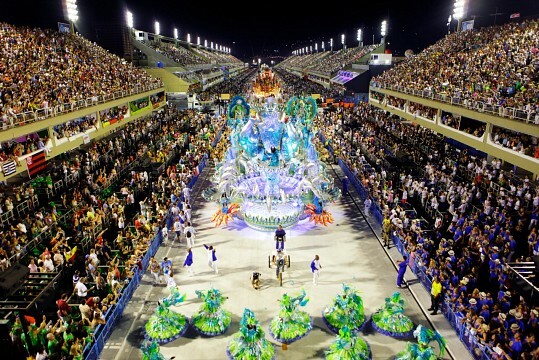 The visual spectacular, which runs for a week and culminates in the ‘final’ held at the Sambódromo, is a feast of music, dancing, drinking and insanely colourful costumes and floats. Visiting Rio at Carnival time is arguably the best bet, as you’ll find the city simply bursting with festive spirit. Even if you don’t manage to get tickets to the final, or choose to forgo the exorbitant expense (tickets go for anywhere between USD100 and USD3000), you’ll find samba street parties and mini-Carnivals held in every single suburb, every night of the week. To the average international tourist, Rio has always come across as an exciting but dangerous place to visit. The lure of the extraordinary Carnival acts as a strong magnet for many yet fear about safety has kept just as many away over the years. The Brazilian government and tourism board have done much, in recent years, to improve the city’s somewhat dodgy reputation. Renowned as a mecca for petty and at times very violent criminals, Rio has always been regarded as one of the world’s most dangerous cities, although much of the hype was quite unwarranted. Rio’s crime rate has always been related to the abject gap between rich and poor, the various criminal gang activities and other home-grown issues. 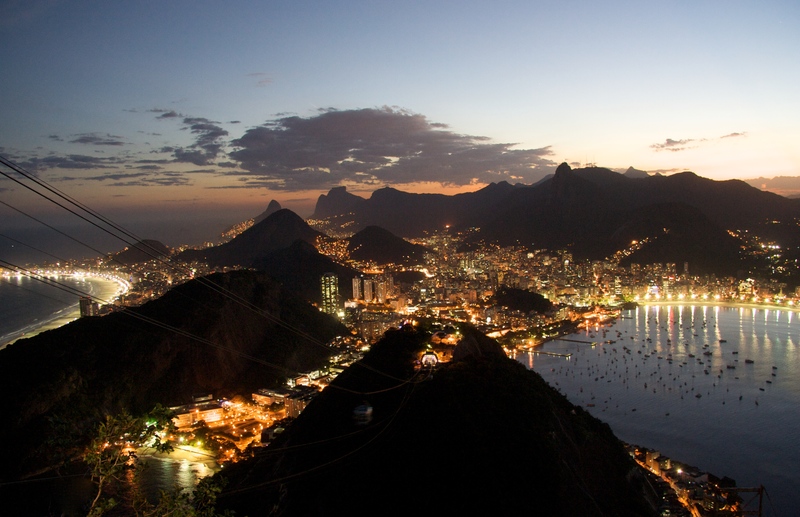 For tourists, Rio is no more dangerous than New York, Paris or any other major city: knowing which areas to avoid (especially at night), and taking some simple precautions to keep yourself from harm, will ensure you won’t remember your Brazilian adventure for all the wrong reasons. Although exploring a foreign city by public transport is usually a lot of fun this is perhaps the one thing you may want to miss doing in Rio. Taxis are inexpensive, plentiful and by far the safest form of transport here, particularly at night. Walking alone after dark is a major no-no in town, as is taking a late-night stroll along Copacabana or Ipanema beach. When going to the beach during the day, do not bring any valuables with you, bar a few dollars for a drink and some snacks. The rest is simple common sense: don’t do anything in Rio which you probably would not even do in your own country. This includes heading off with a stranger for a ‘personal tour’ of the city or walking home alone, inebriated, late at night. Rio is Brazil’s second busiest hub after Sao Paolo and home of the extremely busy Galeão - Antônio Carlos Jobim International Airport, found only about 20kms north of the city’s centre. 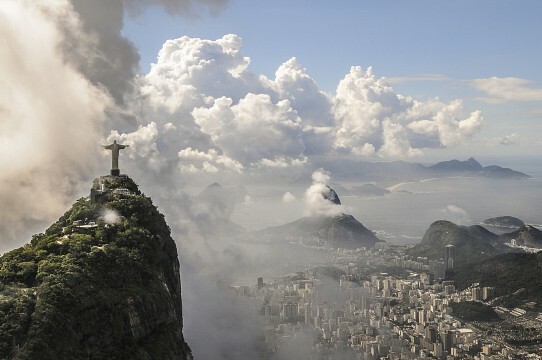 Several dozen major airlines connect Rio to prominent capitals in Europe, North America, South America, the Middle East and Africa. From Asia, most flights are redirected to either Buenos Aires or Santiago, or fly via Los Angeles or New York. If it’s your first time visiting Rio, we highly recommend you organise a private transfer to your hotel from the airport, as the city’s public transport system can be a headache at the best of times, let alone when you’ve just arrived. Once you’ve settled into your hotel you’ll find several ways to get out and about. Taxis, no matter the expense, are still the preferred mode of transport by foreigners and should be the only option you consider after sunset. Rio’s notorious traffic jams can make calculations of taxi rides a little skewed but, by and large, a ride from the airport to Copacabana should cost about R$50 and take about half an hour. Should you be flying out in the early evening, however, you should account for the ride to take about an hour and a half. Taxi rides within Zona Sul and Centro are reasonably priced, but do make sure you only take registered0 feeted taxis. The cheapest way to get around the city, and the most convenient to get around the southern zones thanks to dedicated road lanes, buses are a great options for adventurous travellers who don’t mind getting stuck into the thick of things. If you do want to get to know the bus routes of your chosen area, the concierge of your hotel or hostel will definitely be the best person to advice you. Rides cost only R$3 per ride, but do be mindful of your belongings. Rio’s subway is slightly more expensive that its buses but infinitely more comfortable, convenient, safe and clean too. It operates from early morning until midnight, but only boasts two lines, so although it’s great for certain areas of the city, it will not be possible to reach every corner of the city by metro.